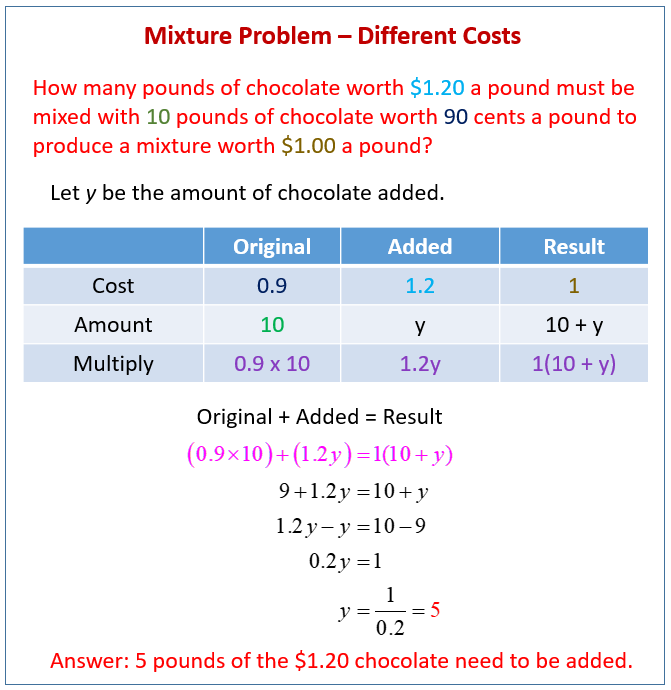 How many pounds of chocolate worth $1.20 a pound must be mixed with 10 pounds of chocolate worth 90 cents a pound to produce a mixture worth $1.00 a pound? Set up a table for different types of chocolate. Example: At the Grind House, Honduran coffee sells for $8.00 per pound and Costa Rican coffee sells for $11.50 per pound. If one pound of the Central American Blend coffee contains 0.4lb Costa Rican coffee and 0.6lb Honduran coffee, how much should one pound sell for? Example: How many liters of a 10% salt solution should be added to 80 liters of a 35% salt solution to obtain a mixture that is a 30% salt solution?